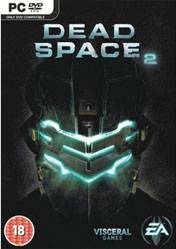 Dead Space 2 is a survival horror third-person shooter video game developed by Visceral Games. Dead Space 2 is a survival horror third-person shooter. The player controls Isaac Clarke from a third-person point of view, looking over the character's right shoulder. The game features no HUD, relying on holograms projected from the player character and his weapons to show information such as messages and ammunition count, respectively. Player health and stasis are shown by visual indicators on Isaac's back. Isaac must fight an alien organism that infects and takes control of human corpses, turning them into "Necromorphs", mutating their bodies. The player acquires two modules; a "stasis" module, allowing the player to slow down enemies or objects, allowing for otherwise insurmountable moving obstacles such as active heavy machinery to be slowed down, allowing Isaac to safely pass, and the "kinesis" module, which allows Isaac to manipulate objects and machinery telekinetically. The player may upgrade their weapons and armor at work benches, using power nodes found throughout the game. In-game stores may be accessed where the player may buy and sell various items and attain new weapons and suits through the acquisition of schematics found throughout the levels. Si os gusta el terror este es vuestro juego.